Copenhagen is the home of hygge, the concept that is taking the United States by storm. There is no word for it in English; it conveys the idea of comfort, coziness, and charm and applies to any situation, whether at home or out, with friends, family, or alone. An example would be sitting by the fire when it's snowing out with a loving partner, a good book, a cuddly blanket or sweater, and a cup of tea or coffee. After you've been comforted to the max and checked out Copenhagen's former royal palaces, museums, and gardens, it's a relatively easy trip to Stockholm, which exudes a different vibe, despite their mutual Nordic roots. Stockholm boasts that it is a place where you find new perspectives and different ideas, a mind-opener. It's all about new experiences. 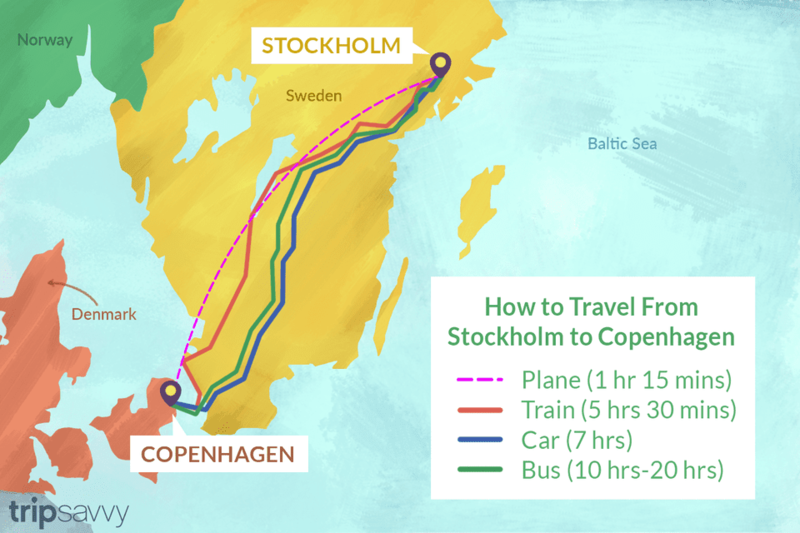 You can travel from Copenhagen to Stockholm in several different ways. All can be booked in advance, and each option has its pros and cons. If you can't decide which way you like best, you can go to Stockholm via one option and return to Copenhagen via another. You can fly to Stockholm from Copenhagen and back via a direct flight, and they are offered daily. It takes about one hour and 15 minutes to fly between these two cities. Depending on the time of year, round-trip flight prices between Copenhagen and Stockholm can come down to double digits. It's by far the fastest option but don't forget to factor in getting to and from both airports and going through any security checkpoints. Taking the train from Copenhagen to Stockholm usually costs less than getting there by plane, though it's a 5.5-hour trip. Train tickets are cheaper midweek and on night trains, while weekends are pricey, no matter if you're going from Copenhagen to Stockholm or the other way around. You can get train tickets and see prices at RailEurope.com. The third option is to rent a car to get from Copenhagen to Stockholm. It takes longer, but if you like road trips, you'll appreciate the view and get a feeling for the countries that only a road trip can give you. It's about a seven-hour drive that covers 370 miles (600 kilometers). You'll follow the E20 across the Oresund Bridge (toll required), which connects Denmark and Sweden across the narrow Oresund Strait, to Malmo and on to Helsingborg. From there, take the E4 all the way to Stockholm. This is likely one of the slower and cheaper options, but it could be the most interesting if you have the time and the inclination. It's super cheap, but taking the bus from Copenhagen to Stockholm and back again is also a slow, arduous transportation option. The travel time by bus is 10 to 20 hours, including bus changes. Check timetables and pricing at Swebus Express (Copenhagen is listed as Kopenhamn).